Location of Island Park in Fremont County, Idaho. Island Park is a city in Fremont County, Idaho, United States. The city's population was 286 at the 2010 census, up from 215 in 2000. The city was incorporated by owners of the many lodges and resorts along U.S. Route 20 in 1947, primarily to circumvent Idaho's liquor laws that prohibited the sale of liquor outside of city limits. It is only 500 feet (150 m) wide in most locations and, at 33 miles (53 km), claims to have the longest "Main Street" in the world. Island Park is part of the Rexburg Micropolitan Statistical Area. Island Park is located at 44°29′59″N 111°20′19″W﻿ / ﻿44.49972°N 111.33861°W﻿ / 44.49972; -111.33861 (44.4996, −111.3387), at an elevation of 6,293 feet (1,918 m) above sea level, making it the highest city in Idaho. According to the United States Census Bureau, the city has a total area of 6.77 square miles (17.53 km2), of which, 6.64 square miles (17.20 km2) is land and 0.13 square miles (0.34 km2) is water. 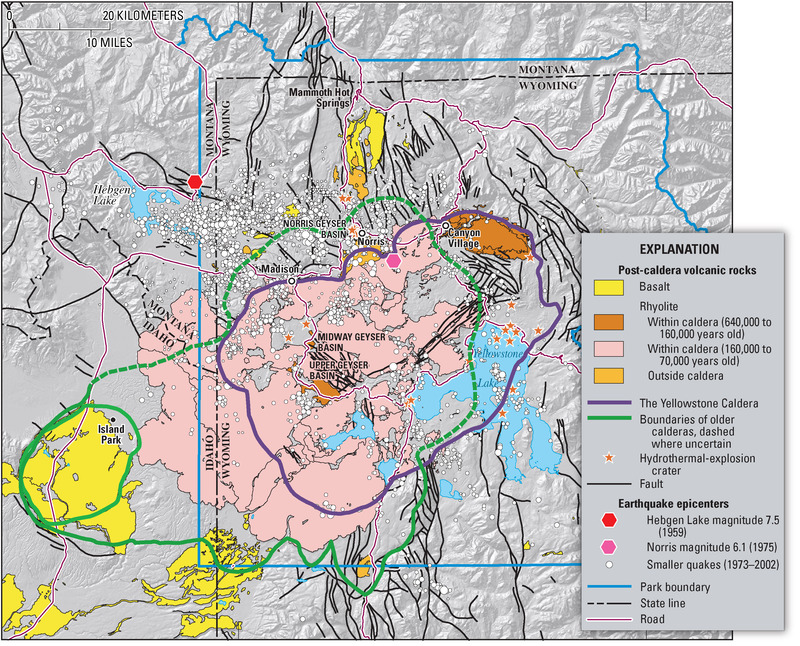 Although much smaller than either the Island Park Caldera or the Yellowstone Caldera, the Henry's Fork Caldera is still one of the largest calderas in the world and is the only large caldera in the Yellowstone region that is plainly visible. It has a nearly level 20-mile (32 km) wide circular floor that slopes slightly towards the southeast. The caldera floor is at about 6,000 feet (1,830 m) of elevation with the rim generally being several hundred feet higher. The Henry's Lake Flat area, north of the caldera, is a little higher. Henry's Lake is at 6,500 feet (1,980 m) with the flats sloping slightly southward towards the caldera. The Island Park area is mostly forested with many meadows and grasslands. It is mostly level but is surrounded by forested hills and high mountains in the north. The Henrys Fork of the Snake River meanders through Island Park with its headwaters at Henry's Lake and at Big Springs (Idaho). The Henry's Fork is impounded by Island Park Dam to form Island Park Reservoir at the rim of the caldera just north and just outside the caldera. In fact, the entire south bank of Island Park Reservoir is formed by the northern slope of the caldera. The Henry's Fork crosses through the caldera and then cascades off from it at Upper and Lower Mesa Falls. The geography of Island Park is actually unique and distinctive. It is largely flat and it has unusually high precipitation. Island Park is at the same 6,000 feet (1,830 m) of elevation as Teton Valley, Idaho, Jackson Hole, Wyoming, or the Centennial Valley, Montana yet these nearby areas are semi-arid prairie or even desert receiving less than 12 inches (30 cm) of precipitation annually while Island Park is forested and green with many streams, ponds, lakes, and meadows. Island Park receives well over 30 inches (76 cm) of precipitation with parts receiving over 50 inches (127 cm). That is, Island Park has three times the rainfall and snowfall as nearby areas of the same elevation. Island Park is different from almost anywhere in the world. The Snake River Plain that was also formed by the Yellowstone hotspot is in line with the gap between the Sierra Nevada and Cascade mountain ranges along the West Coast of the United States so that there is a moisture channel that extends from the distant Pacific Ocean, between the Cascades and Sierra Nevada, through the Rocky Mountains to Island Park. This abundant precipitation in Island Park falls on the relatively level floor of the caldera where it forms numerous meandering streams, ponds, marshes, and meadows. It also falls on the higher areas to the east along the Yellowstone Park border where it percolates though the granular volcanic deposits to emerge as some of the largest springs in the world. Big Springs, Buffalo River Springs, and Warm River Springs all are 1st Magnitude springs and they form some of the crystal clear meandering streams that the area is famous for. As of the census of 2010, there were 286 people, 122 households, and 74 families residing in the city. The population density was 43.1 inhabitants per square mile (16.6/km2). There were 692 housing units at an average density of 104.2 per square mile (40.2/km2). The racial makeup of the city was 96.9% White, 0.7% Native American, 1.7% from other races, and 0.7% from two or more races. Hispanic or Latino of any race were 6.6% of the population. There were 122 households of which 19.7% had children under the age of 18 living with them, 55.7% were married couples living together, 2.5% had a female householder with no husband present, 2.5% had a male householder with no wife present, and 39.3% were non-families. 33.6% of all households were made up of individuals and 5% had someone living alone who was 65 years of age or older. The average household size was 2.28 and the average family size was 2.97. The median age in the city was 45 years. 19.2% of residents were under the age of 18; 6.2% were between the ages of 18 and 24; 24.4% were from 25 to 44; 34.2% were from 45 to 64; and 15.7% were 65 years of age or older. The gender makeup of the city was 53.5% male and 46.5% female. As of the census of 2000, there were 215 people, 90 households, and 57 families residing in the city. The population density was 34.6 people per square mile (13.3/km2). There were 425 housing units at an average density of 68.4 per square mile (26.4/km2). The racial makeup of the city was 95.81% White, 0.93% Asian, 2.33% from other races, and 0.93% from two or more races. Hispanic or Latino of any race were 4.19% of the population. There were 90 households out of which 22.2% had children under the age of 18 living with them, 55.6% were married couples living together, 6.7% had a female householder with no husband present, and 35.6% were non-families. 27.8% of all households were made up of individuals and 2.2% had someone living alone who was 65 years of age or older. The average household size was 2.39 and the average family size was 2.93. In the city, the population was spread out with 19.5% under the age of 18, 11.2% from 18 to 24, 27.4% from 25 to 44, 28.4% from 45 to 64, and 13.5% who were 65 years of age or older. The median age was 42 years. For every 100 females, there were 112.9 males. For every 100 females age 18 and over, there were 119.0 males. The median income for a household in the city was $26,250, and the median income for a family was $30,000. Males had a median income of $22,292 versus $16,250 for females. The per capita income for the city was $15,617. About 21.0% of families and 23.9% of the population were below the poverty line, including 37.9% of those under the age of eighteen and none of those sixty five or over. Island Park has a humid continental climate (Dsb), bordering on a subarctic climate (Dsc). ^ "Idaho cities by highest elevation". Maps-n-Stats. Archived from the original on 2011-10-10. ^ Dean H. Green, A History of Island Park, 1990, p. 6. This page was last edited on 19 July 2018, at 09:31 (UTC).